Spring Bash 2016 is April 16. 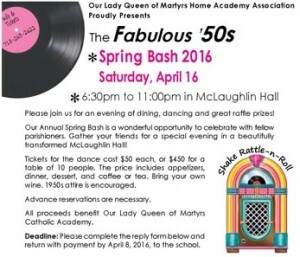 Get out your poodle skirts, because we’re going back to the fabulous fifties for the evening to raise funds for Our Lady Queen of Martyrs Catholic Academy. To request tickets ($50/person), contact the OLQMCA Home Academy Association: haa@olqmca.org, 718-263-2622. Ticket price includes appetizers, dinner, dessert and coffee or tea. Bring your own wine. To download the order form for Spring Bash tickets, as well as a rate sheet for other sponsorship opportunities, click here.